Students in grades 1-3 receive self-contained classroom instruction. Class size is limited to ensure adequate time for individualized instruction. Understanding that children learn using different modalities, teachers use various strategies to teach skills necessary for progressing to the next level. All of our classrooms have a computer for student enrichment and Accelerated Reader testing. Thomas Sumter Academy uses the Houghton Mifflin Reading Series. This series uses a systematic, integrated approach to teach spelling, language, reading, phonics, structured writing, and grammar. The “Step Up To Writing” model is used to encourage self-expression through creative writing. This program offers a systematic approach to learning the writing process from pre-writing to the final copy. Skills progress each year so that by the time a child reaches high school, they have the foundation needed to be successful writers for course requirements, pleasure, and standardized tests such as the SAT. Cursive handwriting is taught second semester of second grade using the Zaner Bloser method of cursive instruction. As children become independent readers, they participate in the Accelerated Reader-Renaissance program which tests comprehension, literacy, and vocabulary skills. Children read books on their individual reading level, and earn points and prizes for their efforts. Wordly Wise is a supplementary vocabulary program that is used to build vocabulary skills in a different context beyond their vocabulary related to reading instruction. The Progress in Math by Sadlier mathematics series is used for math instruction. This series incorporates skills practice with the use of hands-on manipulatives and activities to construct meaning to math concepts. Basic math concepts, their application, and problem solving are emphasized at each grade level. Multiplication is introduced at the end of second grade to ready students for further instruction in third grade. In 1st and 2nd grade, social studies and science concepts are taught in an integrated manner through the Reading curriculum. Topics such as animals, the earth, friends and family, space, and cultures are explored through exciting stories, discussions, and activities. Students also attend the STEAM Lab weekly to conduct experiments and study science concepts appropriate for their grade level. Students further their knowledge of social studies and science concepts by participating in field trips. 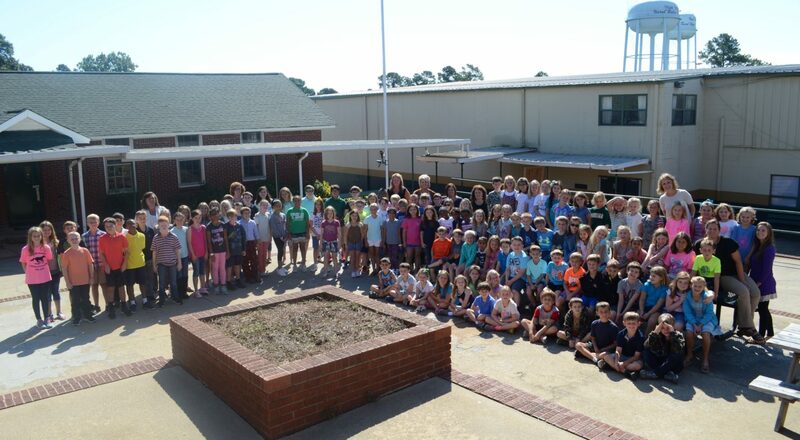 Students participate in classroom and school wide projects such as recycling, fundraising for the Leukemia Society, and adopting children through the Salvation Army Angel Tree project. Third graders use the Pearson Scott Foresman Science curriculum in the classroom. The STEAM teacher correlates with the classroom teachers to conduct science experiments and extension activities that follow the course of study on a weekly basis. Scott Foresman South Carolina is also used for a study of our state’s history. Interesting projects and a trip to the State House in Columbia help bring this study to life for the students. Physical fitness is vital to the total well-being of all children. All students attend P.E. class on a daily basis to develop gross motor skills, teamwork, fundamentals of sports, and to foster a lifestyle of daily physical activity. The 1st -3rd grade curriculum is rounded out by weekly enrichment classes. These classes are taught by gifted instructors who are able to develop each child’s talents and interests in these areas. Art displays, music programs, dance recitals and performances as well as book fairs and book clubs offer opportunities for students to showcase their creativity and talents. Students in grades 1-5 attend a weekly chapel service led by area youth leaders. The Language Arts curriculum is based on the Houghton Mifflin Reading Series and Houghton Mifflin English. The curriculum focuses on literature comprehension, literacy skills, spelling, grammar mechanics and usage, and various types of writing such as paragraphs, expository, narratives, paraphrasing, and poetry. The Step Up To Writing program is used to teach the writing process in a systematic, innovative way to prepare students for writing successfully throughout their high school and college years. The Language Arts curriculum is enhanced by projects, visiting authors, and a field trip to Charleston in 4th grade to visit the setting of a novel by author Idella Bodie. Fourth grade students use Sadlier Progress in Mathematics, and 5th graders use McDougal Little Course I textbooks are used as the basis for math instruction. Students use the textbook along with classroom manipulatives to continue to develop and master the math skills necessary to progress to the next level. The Social Studies curriculum includes Pearson Scott Foresman Building A Nation in 4th grade and Pearson Scott Foresman’s Growth of a Nation in 5th grade. United States History integrated with geography is taught using these resources from the pre-Revolutionary War period to modern times. Other activities and projects on states, capitals and map skills extend the curriculum in both grades. Scott Foresman Science is used in both 4th and 5th grades. Life science, physical science, and earth science are covered in each grade level and knowledge is built upon each year. Students work in cooperative groups and participate in the TSA Science Fair each year. Experiments for each unit are conducted in the STEAM Lab each week and led by the teacher who collaborates with the classroom teachers to design and organize the activities. Physical Education is offered weekly in a combined 4th and 5th grade class. Students do not dress out for P.E. and are engaged in activities that develop motor skills, coordination, and fundamentals of games and sports. Students participate in The Presidential Physical Fitness Award program. The 4th and 5th grade curriculum is rounded out by weekly enrichment classes in Dance, Library, Spanish and Bible. These classes are taught by gifted instructors who are able to develop each child’s talents and interests in these areas. Art displays, music programs, dance recitals and performances as well as book fairs and book clubs offer opportunities for students to showcase their creativity and talents. In order to keep reading and comprehension skills fresh over the summer months, a summer reading program is in place for rising 1st – 5th Graders. Contracts and guidelines for each grade level are sent home each spring. Guidelines vary according to grade.